I've searched for years for a delicious wheat bread recipe that would raise well. 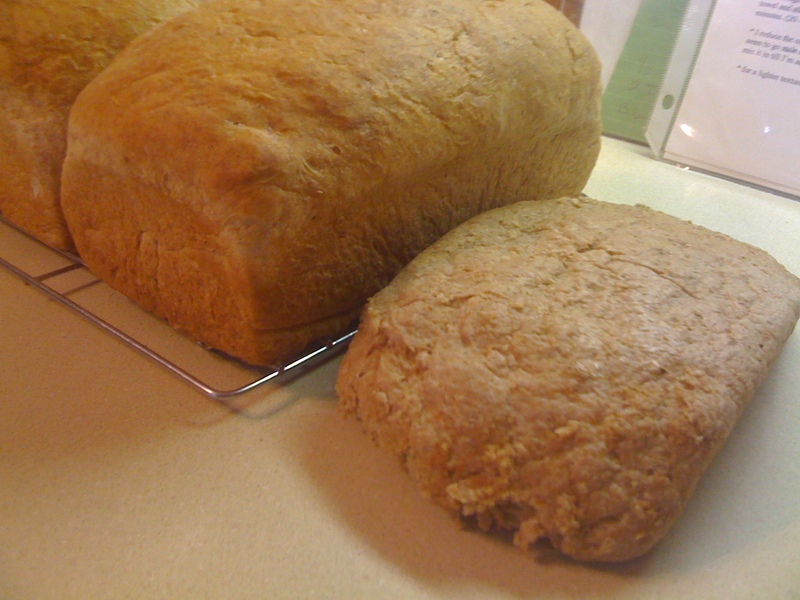 Lets face it, wheat bread is usually heavy and slow to raise. 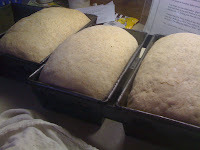 My friend Eva and The Momma's loaves are always tall and tasty, so I asked them for the recipe... 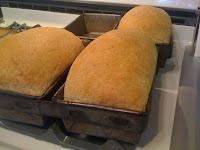 Turns out I already have it (Marilyns Famous Bread Recipe), but my loaves were not that great - they were flat! I'm not a horrible bread maker, so I was puzzled. I don't use a bread maker or mill my own flour, but I use quality flour. Turns out, The Momma has changed the recipe slightly... So here is the adjusted recipe from The Momma**. Combine the warm water, yeast, and 2 Cups of fresh whole wheat flour in a large mixing bowl. Allow to sponge for 15 minutes. Add the honey, oil, dough enhancer, salt and 4-5 cups additional flour until the dough begins to clean the sides of the mixing bowl. Do not allow the dough to get too stiff (too dry). Dough should be smooth and elastic. It is a common mistake for the beginning bakers to add too much flour. Knead the bread by hand 7-10 minutes or until it is very smooth, elastic, and small bubbles or blisters appear beneath the surface of the dough. Six to ten minutes of kneading should be sufficient to develop the gluten if you are using fresh flour. If you are kneading by hand, be sure to add the minimum amount of flour to keep the dough soft and pliable by using a tsp of oil on your hands and kneading surface. Turn dough out onto floured surface, shape loaves and place in prepared greased loaf pans. Cover with a towel and allow to rise in a slightly warmed oven or other warm place until doubled in size (about 30-60 minutes). Bake loaves for 25-30 minutes in a 350º oven. Bread is cooked through when it sounds hollow when tapped on the bottom, and when the top and sides are a golden brown color. I like to take a stick of butter and run it over the fresh baked loaves. My family was thrilled to have good fresh wheat bread and I'm tickled to have a great recipe and wanted to share it with you. If you need to see the recipe for a bread machine or are just curious, click the link above for Marilyn's bread. **The Momma and Eva both use a Bosch or similar type bread machine for mixing and kneading.